This rug is " one of its kind " and is a perfect piece as a wall hanging. It has taken more than 4 months to weave this beauty. The primary colors are ivory, pink and blue. Number of Knots in this rug are 324 knots per square inch. This is ideal for the guest room. - Kashmir silk carpets are hand-knotted in Kashmir India and are modelled on traditional Persian carpets. 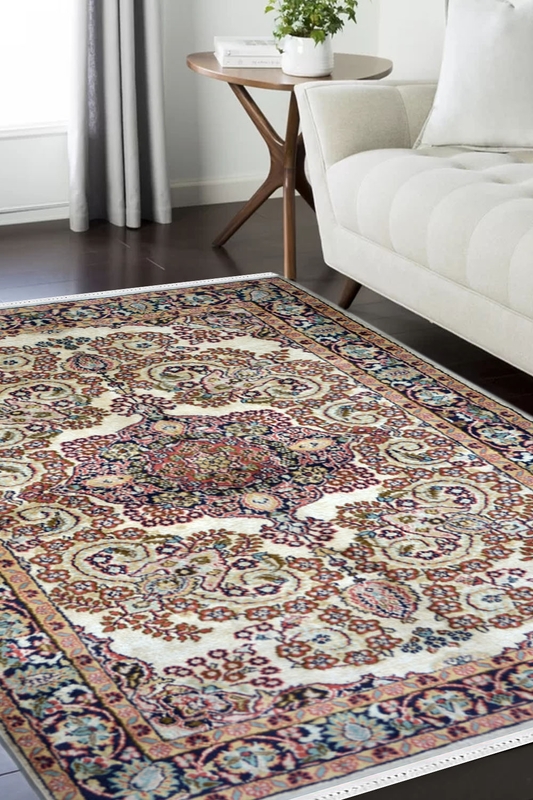 - This carpet contains oriental patterns which consist partly of medallions and repeated patterns of flower motifs. - This carpet is of very high quality. - This is pure silk so that the trends are thin and light, with a Beautiful shimmering brightness. - Using silk also makes detailed patterns possible and the precision in the work behind the carpet is impressive. - This beautiful Kashmir carpet in silk can give a perfect look to any room. - Warp is of the finest quality of cotton and weft is in pure silk.